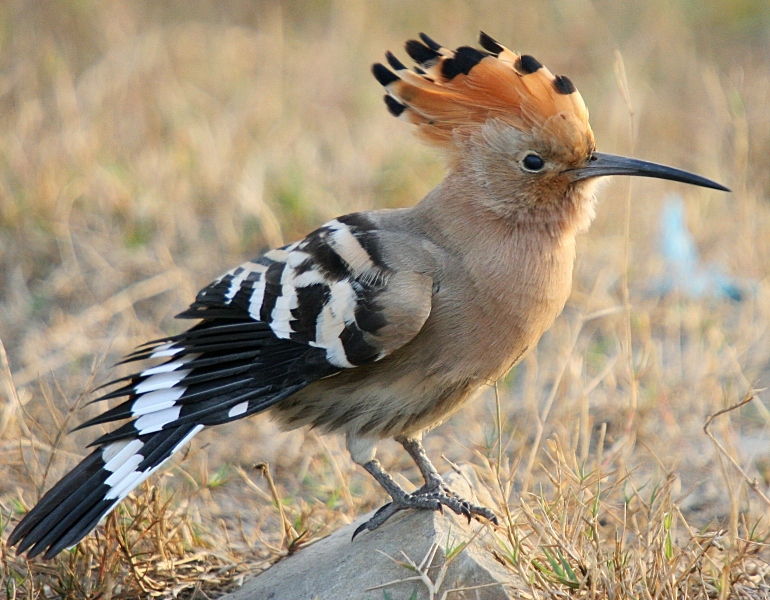 I will readily accept that many people reading this post will not believe that I saw a hoopoe last week. Sightings of hoopoes in Dumfries and Galloway are so rare that the last recorded and verified appearance was almost five years ago. But I gladly open myself to scorn and disbelief by saying that beyond any doubt whatsoever, I saw a hoopoe on two occasions. It was standing out on a long, dusty track where I was working a few miles west of the Chayne and rose up on black and white striped wings at a distance of about fifty yards. Surprisingly weak on the wing, it flew rather like a little jay, taking wide, paddling grasps of air and undulating slightly like a woodpecker. When it landed, it was over a hundred yards away and revealed a massive head which can only have been a raised crest viewed from a distance. I have seen hoopoes before in Sicily and there was certainly no mistake. The following evening, I saw it again at a distance of around two hundred yards, flying over a young plantation of sitka spruce trees. Despite careful examination during subsequent nights, I haven’t seen it again for almost six days. I hope it has the sense to head south where the weather will be more appealling to its mild African disposition. Looking online, I see that a hoopoe was once found on Shetland, so while Dumfries and Galloway is quite a long step from the Mediterranean, it could have been worse. Asking around amongst local keepers, one or two have seen hoopoes at various stages of their lives. I’m no twitcher, but to have this fantastically unusual bird land almost on my doorstep certainly has made me keep an eye on the skies. If that white throated needletail swift on the Isle of Harris is anything to go by, there is probably a streak of hoopoe mince trickling down the blade of a wind turbine somewhere in the vicinity by now. The “working for grouse” project took a huge leap of progress this afternoon when I took receipt of a 37 year old David Brown 996 tractor. The nature of my work on the hill is on such a small/remote/awkward/experimental scale that trying to find contractors who are willing to co-operate is not an easy task. After having been provoked into a situation of near madness by the failure of the usual contractor to disk the game cover before the silage cutting started, it became apparent that some independence was required. After a certain amount of to-ing and fro-ing, a decent machine was found in Dumfries to fit the bill. I don’t expect that the “new” tractor will be able to perform miracles, but it will allow me to plant my own game covers (this year’s cover STILL isn’t in…), spray where I want to spray and mow the rushes in the manner that I choose – (I find it appallingly difficult to find tractor drivers who will cut rushes and marginal moorland in anything other than precisely straight lines). I have a limited array of implements but will soon add to these to create a catalogue of suitable flails, harrows, spreaders and sprayers. 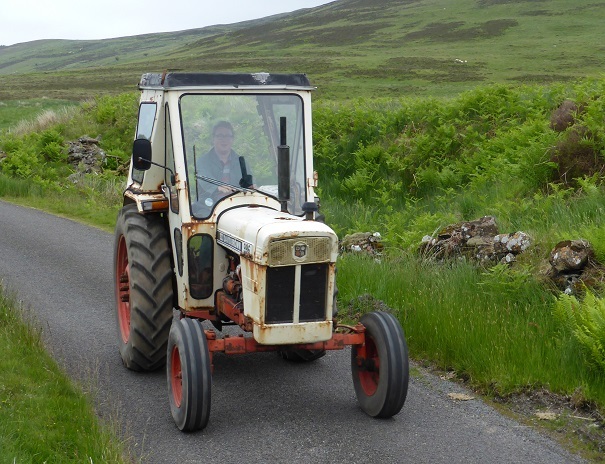 The big bonus to this tractor is that it was sold with dual wheels, opening up a whole new world of opportunities in the damper, boggier reaches of the Chayne. Once they are fitted, we’re really going places. Although it doesn’t look like much just now, I’m quite convinced that every farmland conservation project requires some heavy machinery. There are certainly more glamorous and capable tractors in the world, but this is certainly a start. What better way to spend a miserable sunday in June than by taking the dog for a walk in the Galloway Forest Park near Shalloch on Minnoch. 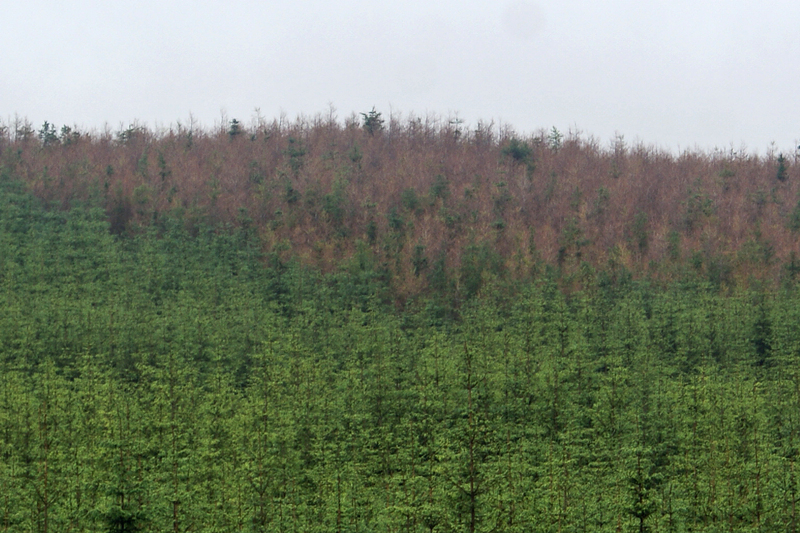 There has been some minor coverage in the news about phytophthora outbreaks in Galloway, but it’s hard to over-emphasise just how dramatic thousands of dead larch trees look across hundreds of acres. With only a few exceptions, all the larch trees were either stone dead or fizzling out with just a scattering of healthy twigs and branches. The sitka spruces have not been affected by the disease, so they provided a surprisingly welcome green presence to the hills. I wouldn’t normally be pleased to see sitka spruce trees in any circumstance, but with the entire area blighted like the aftermath of some nuclear explosion, even spruces were welcome. With classic irony, this strain of phytophthora has destroyed the only commercial tree species which has value to black grouse. Great expressionless acres of sitka continue to prosper over the southern uplands without challenge, whereas every larch tree infected deprives greyhens of yet another source of feeding. At the head of the Minnoch glen, I stopped to look at what was formerly one of the biggest lek sites in Dumfries and Galloway. When I visited in 2009, there were 22 blackcock on the heather by the side of the road. This fell to five within a single year, and by 2011 there were only two birds. I haven’t seen black grouse at that lek for eighteen months, and despite being assured that some of those birds have moved elsewhere, there is no question that something has gone seriously wrong. The RSPB released statements last spring to say that the numbers of black grouse in the Galloway Forest Park went up in 2011-2012, but the population we’re talking about is still so piddling that there is very little to celebrate. Given the enthusiasm which pushed out these press releases, I daresay that it’s important to make the subscribing public feel as though their donations are being spent constructively, regardless of the context. I had an interesting conversation with someone from the management of the Galloway Forest Park last year who claimed that Forestry Commission Scotland research had shown that predator control makes little difference for black grouse numbers, and he also visibly winced at the suggestion of burning heather as part of a management plan for black grouse. Ignoring the fact that the Galloway Forest Park actually does employ an “off-the-record” gamekeeper to control vermin in the vicinity of the lek sites, the decision not to burn is a pity. On conservation grounds, the land has been so monumentally banjaxed by the advent of commercial planting that fretting about the environmental impact of a few burns seems rather absurd. In truth, they’re probably too fretful that their trees might get singed, so the heather grows rank and useless while the walls of sitka shade it out. I can’t help thinking that proper moorland management on the unplanted areas (and there are some extensive areas without trees) would go some way towards mitigating the harm caused by the spruces, but this doesn’t seem to be of much interest to those responsible. Instead, the heather grows leggy and unable to support anything except the most determined meadow pipits. There should be blue hares and blackcock around every corner along that back road to Straiton, but (aside from it being late for leks etc.) I spent the day driving it yesterday and saw nothing more interesting than a single wheatear. It was interesting to look at some experimental cuts which have been put into the heather around one of the main black grouse leks. This appears to be a compromise for failing to burn, and it is on such a miniscule scale that it merely draws attention to the half-hearted nature of the job. I am increasingly warming to cutting as a management technique, and as much as I was ready to pour scorn on some of the cuts near the lek sites, the regeneration was actually pretty good. One of the major downsides to cutting heather is the slow, difficult and expensive nature of the job. I have seen cutting on a few moors managed by charities who don’t like to burn, and my first reaction is usually: “is that all?” It becomes a major job to cut anything like as much heather as it is possible to burn in a similar timeframe, and many cutting enthusiasts are content to manage as much heather in a season as a burner could cover in a day. Where cutting has been impressive is where the cutters have really got stuck in and made a visible difference over several hard weeks of labour. It is usually best to combine cutting and burning to get the best characteristics of both, and while advances in technology are making cutting ever more versatile and practical, there are serious restrictions of time and money when it comes to rolling it out on a landscape scale. As much as I’d love to see that big lek back on the roadside, I don’t think a few afternoons of the tractor pulling a disc flail around the place are going to make much of a difference. As part of a unrelated side-line, it’s worth mentioning that my preparations for Christmas have begun. Buying hatching eggs on eBay is an extraordinarily mixed bag – I’ve had 100% hatches and I’ve also had nothing to show from a clutch of a dozen. Sending eggs through the post is a hit and miss business, but I couldn’t resist bidding on some turkey eggs when I saw them for sale last month. My eye was caught by Crollwitzers – a striking black and white breed of turkey which has become rather rare over the past few years – sidelined by heavy and more productive commercial breeds. Attracted by their rarity and the possibility of making some fantastic Indian head dresses out of their tail feathers, I clicked the “buy it now” button for a dozen. As can be the case with posted eggs, the parcel arrived in a gooey custard of yolk and egg-white. Three eggs had smashed and I didn’t hold out any high hopes for the survivors. After five days, I candled them and found that the majority were clear. The four eggs which were showing signs of life had broken air sacs, which can often mean that the chick will develop perfectly and then be unable to hatch. Feeling pretty gloomy about the whole thing, I put them at the back of the incubator and concentrated on my partridge eggs (as much as a stuttering electrical supply from Scottish Power would allow – although more on this later). I was quite impressed to find that one of the four eggs had pipped on day 27, and was extremely pleased to find a huge chick wriggling around on the floor of the hatcher the following morning. Another two hatched with some assistance and the fourth egg simply gave up the ghost. Having grown used to partridge eggs, the sheer size of the turkeys was quite impressive. Not only are they large, but they have a manner about them which can only be described as “extremely spunky”. 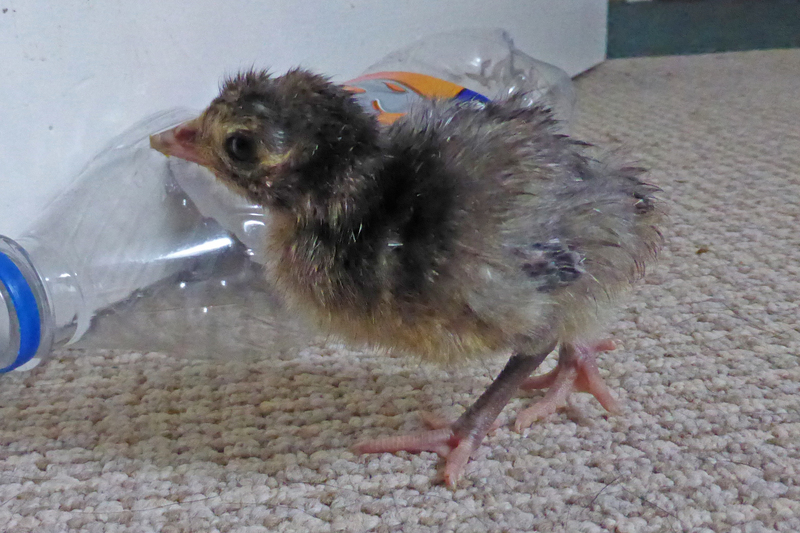 They fight, leap, squabble and bound around the brooder, and when I took one of them out for a photograph (above), it ran up to Scoop the dog and pecked her soundly on the claw. Being a labrador, Scoop was profoundly apologetic and looked at me with an expression of pure embarrassment. Not particularly related to grouse, partridges or heather moorland, but very interesting nonetheless. Just worth posting as a post script. 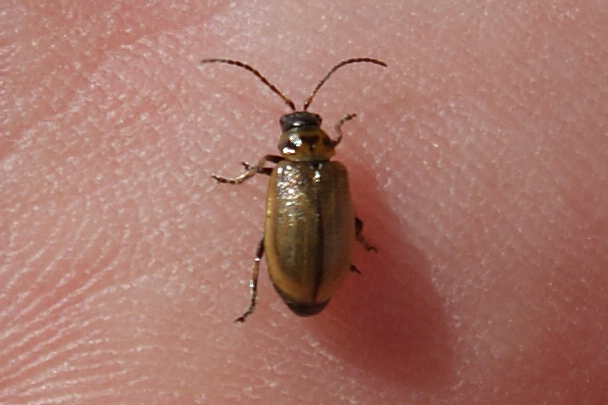 that I took my first photograph of a heather beetle while looking at some cutting work on Langholm Moor yesterday. The little blighter was skipping cheerily along a clump of star moss, and I managed to gather him up just long enough for a photo. Quite a mild, innocuous looking little creature to have caused damage measured in the thousands of both acres and pounds. The fact that he was there doesn’t necessarily mean that Langholm is in for another beetle outbreak. Heather beetles can be found on every area of moorland in Britain, and the problems only arise when they have massive population explosions. Fingers crossed that he was a one-off, although I must admit that before I could bring his ambitions to an end, I dropped him and he made a speedy getaway in the ensuing confusion. The habitat at Langholm is fantastic – so where are the grouse? After another fantastic visit to Langholm Moor on Wednesday, I came away with a surprising feeling of gloom. I was sent to gather information for the Heather Trust on treatments for heather beetle on the south end of the moor, and spent a great afternoon with Simon Lester (the head keeper) under chattering harriers and squeaking merlins. I’ve posted on this blog before about the damage caused by beetle at Langholm during 2009 and 2010 and the subsequent treatments which have since brought the lower ground back up to speed. In truth, the habitat recovery is extremely impressive. It is just three weeks since I was last at Langholm looking at the same areas of treated ground, and the difference now is astonishing. Banks of flowering tormentil, sundew, heath bedstraw, rosemary and emerging asphodel have added a kaleidoscope of colour to the moor, undershot almost everywhere with the glow of tiny cranberry flowers like a pink galaxy of stars across the moss. 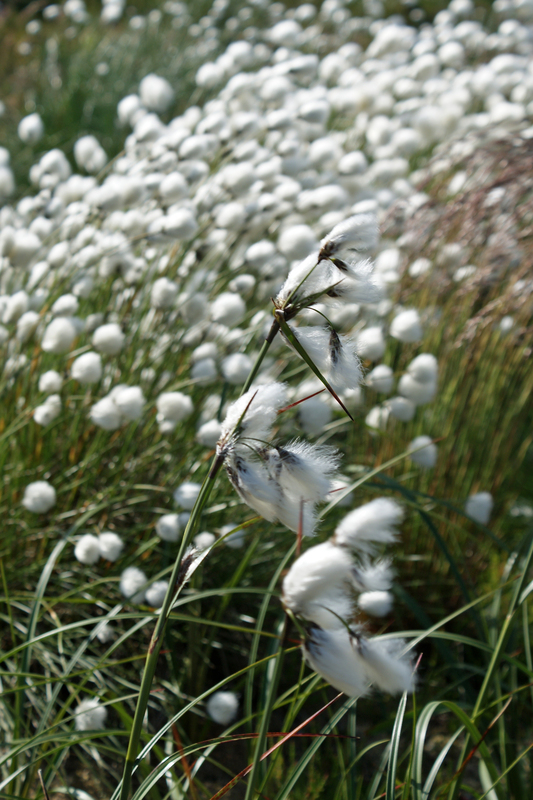 Lush young heather plants crowded together in clumps, and at about thigh-height, oceans of cottongrass fruits bobbed and writhed in the breeze. The most notable absence from the moor was the sheer weight of grouse that this mixture should be supporting. With the return of gamekeepers, the number of grouse at Langholm started to rise after the mess which was left in the wake of the Joint Raptor Study. Within a few years, the grouse stock was well up and looking set to support driven shooting. The keepers even started to fix up the butts in anticipation of the first days, but during the last few years that rising figure has reached a plateau at almost precisely half the amount required to sustain driven shooting. Despite a huge amount of work, the grouse numbers simply will not rise any further. Scientists have noted that the Langholm hens lay more eggs than the national average and the hatch rates are usually very good (95% hatch this year), but the chicks simply aren’t there in any quantity to breed for themselves the following year. With the exception of last year, when the weather was so poor that empirical consistency with other years seems like a far stretch, the simple fact is that grouse are churning out eggs and chicks at Langholm. Productivity is huge and the habitat is some of the best I have ever seen. However, the evidence seem to suggest that the birds are simply not living long enough to continue building up their numbers. From my humble, anecdotal and scientifically useless perspective, I would suggest that the answer has something to do with predation. It’s possible that Langholm was a bad choice of location for a moorland demonstration project. Since the Joint Raptor Study, the moor has been burdened with so much political baggage that it can probably never function as a place of objective science again. Having shown that it is possible to feed breeding hen harriers with day-old chicks so that they do not take grouse, the situation at Langholm no longer has much to do with hen harriers and shooting. Harrier predation is a negligible cause for concern during the breeding season, so we must look elsewhere for the birds which seem to be responsible for killing the grouse – I don’t think that it’s too difficult to imagine that buzzards and ravens have a part to play. These increasingly common predators have nothing to do with hen harriers, and the need to study the impact that they are having on the countryside grows with their expanding range and population. Disturbingly, some people involved at Langholm Moor seem to be totally incapable of admitting that buzzards and ravens play even the most minor and fractional part in the difficulties of growing the stock of grouse. They look instead to obscure theories about habitat fragmentation in order to explain the grouse’s failure to grow, despite the fact that (even with its recovering beetle damage) Langholm is in much better condition than many moors in the Highlands which shoot driven grouse every year. This deliberate myopia is not science but politics – a cynic might interpret it as a deliberate refusal to consider the possibility that birds of prey might be having an effect. A “demonstration project” is the perfect place to run a trial study on raptor predation, but aside from a little tinkering, no such in-depth project seems forthcoming. I’m afraid that even if it did, the old “Langholm Moor is not representative of the U.K. uplands” chestnut would be ressurected to nullify the value of the results anyway. As a result, all the upbeat, positive moorland regeneration work which has been put in since the beetle outbreaks now risks slipping into a stalemate which is apparently beyond resolution. 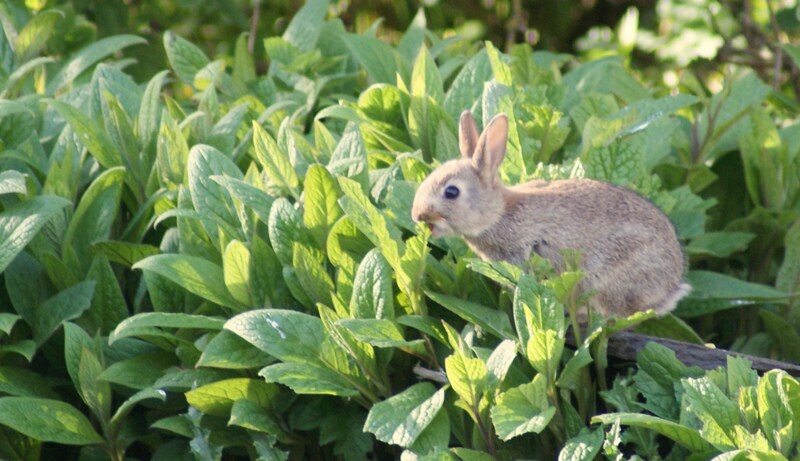 Over the past few weeks, the Chayne’s recently scant rabbit population has suddenly started to boom. Rabbits have been turning up in totally unexpected places, and the hayfield which usually holds just two or three sullen old hoppers now wriggles with more than two dozen keen, sparky little bunnies. My ferreter’s eye is already looking forward to the first frost, but there is something undeniably pleasing about rabbits. They give the place a noticeable buzz of life, and a farm without any rabbits is a dead place indeed. I’m not so naive as to think that their population increase comes without a cost, and given that I’ve killed more rabbits during my life than I could count on a thousand hands, I don’t think I’m being sentimental – they just complete the picture and bring a peaceful balance to situations which would otherwise seem vacant. Just as with woodpigeons (which really are fantastic birds), it’s too easy to curse and swear at rabbits. They have a charm beneath all that hum-drum stupidity, and they can be very exciting to work with. The nature of their cycles has meant that rabbits have been long absent on the Chayne. I remember being able to shoot dozens in a single afternoon around the old barns at the back of the farm, but those huge, formidable warrens have been lying empty for at least six years. On the whole, the entrances have filled in and left the impressive excavations looking like little more than ripples in the ground. Here and there, holes have been serruptitiously widened and used to stash the occasional fox cub, but otherwise the farm is ominously silent. While on one hand I’m keen to see rabbits back, they do bring with them a variety of problems. I will have to get on top of the stoats otherwise their numbers will rise along with their food source and start to pose a problem, and I will certainly take high velocity exception to finding those flossy tailed cutie-pies in amongst my game crop, which will be planted this week.